Home » Mazda » What trims is the 2019 Mazda CX-3 available in? Do you have your eye on a luxurious crossover SUV? Then the 2019 Mazda CX-3 might be on your list. This sleek model receives a variety of updates for 2019, including some minor styling tweaks, a slight uptick in engine power and more standard safety technologies. 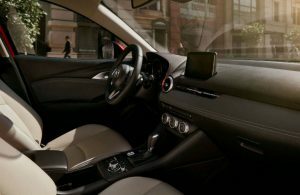 In fact, the 2019 Mazda CX-3 is just as sophisticated as ever and boasts a precision driving experience and a generous selection of high-tech features inside the cabin. There are many ways to build your 2019 Mazda CX-3, which is available in three trims including the Sport, Touring and Grand Touring. Even the base 2019 Mazda CX-3 is standard with a long list of entertainment and convenience technologies. 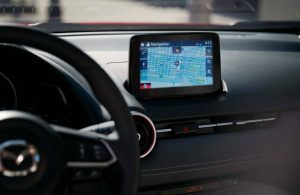 These include a 7-inch touchscreen, the Mazda Connect infotainment system, a rearview camera, Bluetooth, a six-speaker audio system and automatic emergency telematics. A six-way manually adjustable driver’s seat, cruise control, remote keyless entry, frontal collision warning with automatic braking, blind-spot monitoring and rear cross-traffic alert add another level of luxury to the 2019 Mazda CX-3 Sport model. Read More: What are the trim levels for the 2019 Mazda CX-5? For even more luxurious features, consider the 2019 Mazda CX-3 Touring. This sleek model carries over all the equipment from the Sport model and adds a special piano black exterior trim, larger wheels, automatic climate control and a leather-wrapped steering wheel. In addition, the Touring includes keyless entry and ignition, heated front seats, heated mirrors, simulated leather and cloth upholstery and automatic headlights. Moving up to the 2019 Mazda CX-3 Grand Touring trim equips the crossover SUV with even more high-end equipment. These additions include a sunroof, chrome exterior trim, a head-up display, a seven-speaker Bose premium audio system, LED exterior lighting and a navigation system. The Grand Touring trim also includes adaptive headlights, lane departure warning and automatic high beams. The Grand Touring is also available with an optional Premium package that adds even more comfort and convenience features to the CX-3. These include a heated steering wheel, driver-seat memory functions, an auto-dimming rearview mirror and a traffic sign reader. Read More: What are the differences between the Mazda CX-3, CX-5 and CX-9? We invite you to explore all the 2019 CX-3 is capable of with a test drive at Maple Shade Mazda. Here you will find a great selection of vehicles and a dedicated team of experts who can answer any questions you might have along the way. 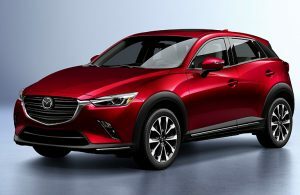 This entry was posted on Friday, March 15th, 2019 at 9:45 pm	and is filed under Comparison, Mazda, Mazda CX-3. You can follow any responses to this entry through the RSS 2.0 feed. You can skip to the end and leave a response. Pinging is currently not allowed.